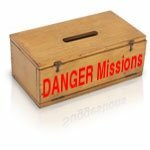 The "Danger Mission" box is an interactive mailbox that will be full of different danger missions written on slips of paper. A curious burner might venture by the box, reach in, and draw a mission that will lead them on an dangerous adventure across the playa! There will also be paper there so passersbys who are feeling creative can add their own danger mission to the collection. I am sure danger missions will accumulate over time, so if you think of a good one write it down or email it to Haley so we can remember them all when the time comes!